Recently, New York Times correspondent Jodi Kantor published “The Obamas,” which examines the nuances of the first couple’s marriage. In her book, Kantor highlights President Obama’s commitment to having dinner with his family five times a week. 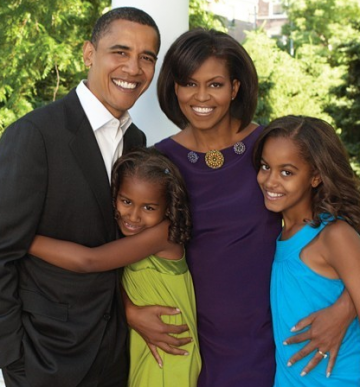 She draws attention to the fact that, after years of missing meals due to a hectic commuting schedule as a state and U.S. senator, living in the White House finally allowed President Obama to join his family for dinner regularly. 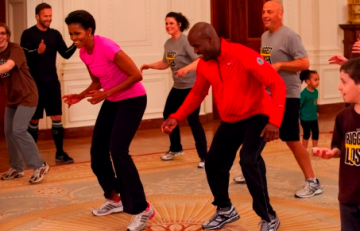 During an interview with Kantor, family therapist Anne Fishel asked about the President’s dedication to family dinners, and whether this commitment is connected to the First Lady’s “Let’s Move” fitness campaign. regular family dinners has been such an important goal for the Obamas? FDP: To what lengths does the President have to go to keep to that commitment? Kantor: It was really a matter of indoctrinating the scheduling staff—who determines who gets time with the President. There are 33 people who are in charge of [his] schedule. If there were meetings scheduled during dinner, he would protest to senior advisors, and tell them they’d have to change the schedule. FDP: Often, parents’ ideas about the importance of family dinners derive from their own childhood experiences—they want to replicate a positive experience they had, or they want to make up for something they missed. What was the role of family dinners in the families the first couple grew up in? Kantor: The First Lady had a stable routine [growing up], with both parents home for dinner. When they got older, she and her brother realized that if their father had had a higher-status job, he might not have been home as much. The President’s father left when he was young. His mom sent him to Hawaii to live with his grandparents. His childhood was marked more by separation and distance. He wants to make it different for his own kids. FDP: Who are your sources on the First Family’s family dinners? Who was willing to talk to you about this nightly ritual? Kantor: I don’t give specific names. I talked to former aides, close Obama friends, about 200 people. FDP: I’m curious about the kind of food that the First Family has for dinner. 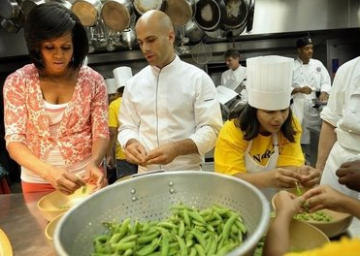 I’ve read that Sam Kass is the White House chef, and that he also cooked for them in Chicago. Is the First Family at all involved in dinner preparation? Kantor: The Obamas don’t cook. Sam Kass takes primary responsibility. Dinner is served to them. The girls help out in a token way, like clearing their plates. They can assemble their breakfasts. FDP: What does the family like to eat? Kantor: I’m not sure what they eat, but you can check on the website that has Sam Kass’s recipes for First Family dinners. FDP: You mention in your book that pie is the President’s favorite dessert. Do they usually have dessert, and if so what? Kantor: My sense is that the President is quite abstemious, and he is not a big dessert eater. They are all very careful eaters. FDP: It’s been reported elsewhere that the first family plays the “rose and thorn” game at the table—a game The Family Dinner Project has also played at our community dinners. In it, everyone goes around the table saying something positive (the rose of the day) and something negative or difficult (the thorn). Do you know what else they talk about at the table? her mission of eradicating obesity and the importance of family dinners? Kantor: Childhood obesity has so many different causes. She doesn’t play up any one cause more than any other. I have not heard her say that every family needs to eat together as much as possible. Part of the reality of living in the White House is that they have incredible privileges. Speaking from the bully pulpit of the White House, she can’t decree that everyone should have dinner when not everyone can. She’s very careful about what she suggests for other people to do. She can’t set standards that people can’t reach. She can’t cause backlash. She has to think about military service men and women, factory workers, check-out workers, who can’t have regular family dinners. FDP: Has there been any evidence that her “Let’s Move” initiative has had an impact on bringing down rates of obesity in children? Kantor: Childhood obesity has been almost an intractable problem. There is no proven formula, no recipe, just some promising research. It’s a measure of her that she chose something really hard—it’s such an ambitious goal. It’s way too early to measure. And, we may never know. If the problem gets better, we won’t know if it’s her influence. She’s been so successful in raising awareness, in changing social norms. There’s never been someone of her stature who’s said that portion size at restaurants is way of out hand. FDP: Thank you very much. Images via ReObama.com, the Obama Foodorama blog, and LetsMove.gov. What a wonderful article and a source of inspiration! My question to President Obama, Ms. Kantor and Dr. Fishel is on the local level: how does one have family dinner when afterschool activities, such as sports, music, and theater, are routinely scheduled at dinner time? Our family is young enough to not have these dilemmas yet; however I appreciate there will be tough choices in the future. As a parent, I will want to encourage my children to participate in activities, both for their own merits as well as for the social and physical benefits. However, I strongly value the established advantages of family meal time. Do we need to press our educators and afterschool leaders to consider these dilemmas? Or, do we need to impress upon parents the value of family time and encourage families to slow down? Or something else?